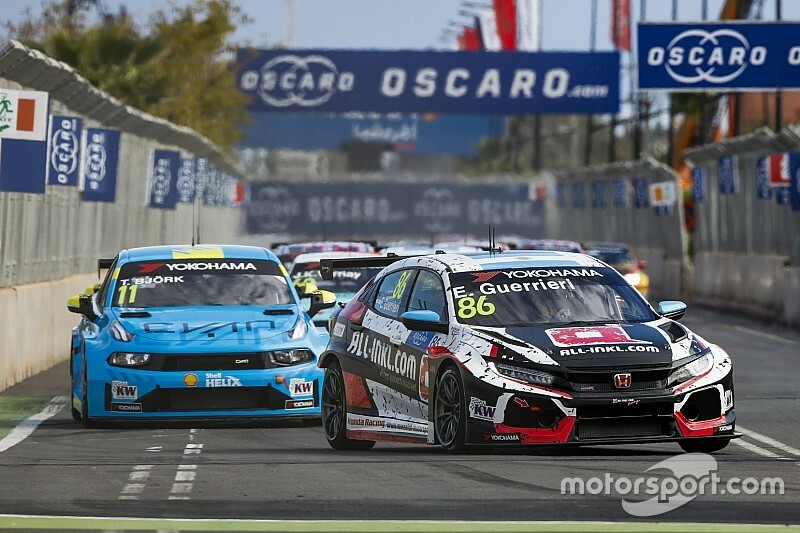 Esteban Guerrieri converted pole position for the first Marrakesh World Touring Car Cup race into victory, resisting Thed Bjork's Cyan Racing Lynk & Co 03 to win the season opener. Munnich Motorsport driver Guerrieri, who earlier on Saturday had claimed his and the team's first WTCR pole in his Honda Civic Type R, was pursued closely by Bjork throughout the race but always appeared to have the Lynk & Co covered. 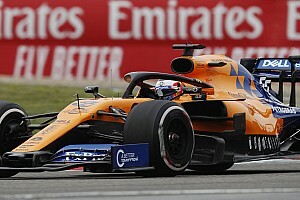 Guerrieri's one real test came at the start as Bjork launched marginally better than him, but the polesitter hugged the inside line through the first corner and emerged clear of Bjork. 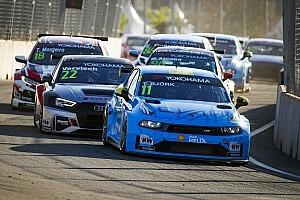 The Swede was never more than a second behind Guerrieri but did not attempt to unseat the Honda driver, who claimed his third WTCR victory by 0.638 seconds. Bjork was closely pursued by Jean-Karl Vernay in the closing stages of the race, but the WRT Audi was demoted to seventh in the classification after nudging Andy Priaulx out of third under braking for the Turn 1 hairpin. Priaulx, making his first World Touring Car start since the end of 2010, made an excellent getaway to jump Guerrieri's teammate Nestor Girolami for third through the opening sequence of corners, and was in sight of the leading duo when his Lynk & Co 03 was hit by Vernay on lap five of 18. Vernay's penalty ultimately promoted Girolami to the final podium position, with reigning champion Gabriele Tarquini fourth in his BRC Racing Hyundai i30 N ahead of Priaulx and Tiago Monteiro - who made a fine start to his full-time return to the series in his KCMG Honda. Frenchman Vernay was relegated into a lonely position in the classification, as the third Lynk & Co 03 of Yann Ehrlacher lacked the pace of the frontrunners. Ehrlacher finished the best part of seven seconds behind Monteiro on the road, and had a significant train of cars behind him throughout the race. He was followed across the line by WTCR debutant Mikel Azcona, but the TCR Europe champion picked up an identical penalty to Vernay for moving Norbert Michelisz aside at the first corner and dropped out of the points. The top 10 was instead completed by Kevin Ceccon's Alfa Romeo Giulietta Veloce and Nicky Catsburg in his Lukoil-backed BRC Hyundai, with Michelisz and the lead Sebastien Loeb Racing Volkswagen Golf GTI of Rob Huff next up. 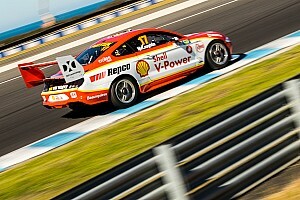 Frederic Vervisch (Comtoyou Audi), Augusto Farfus and the second WRT Audi of Gordon Shedden completed the points. Azcona's teammate Daniel Haglof had been an excellent eighth until he pitted at the end of lap 12. He rejoined the race and remained on the lead lap, but was last of the 20 finishers across the line behind Yvan Muller - who qualified second but was sent to the back of the grid for an engine change - and Attila Tassi (KCMG Honda), who set the fastest lap.